Floor markings are common in manufacturing or warehouse facilities coming in forms such as paint, floor stickers, floor tape, even virtual floor markings. 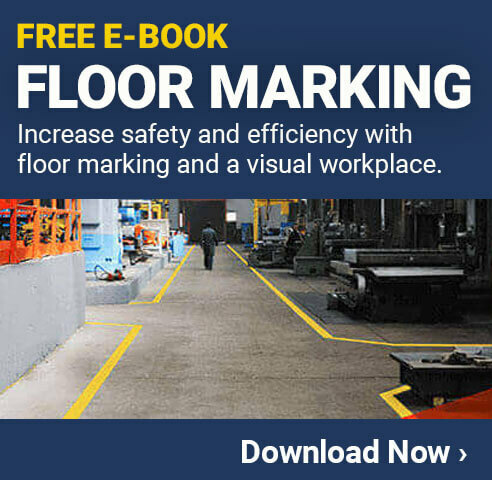 Use floor marking for safety, efficiency, and organization. If you’re considering a floor marking project for your facility, have you considered all the options? Industrial floor paint might seem like the obvious answer, but floor tape is an easier, more cost-effective and longer lasting alternative. Easier installation and requires less equipment to install. Once the tape is laid down it is ready to go, unlike floor paint taking hours to dry. While paint is prone to fading and cracking, industrial floor tape offers protection against forklifts, pallet jacks, trucks, foot traffic, extreme temperatures, and even chemicals. No spilling paint, easy to create straight lines or curved lines. Floor tape can be applied to virtually any clean surface without the need to interrupt the normal flow of work. If you decide to change around your floor markings, removal will be a breeze. 1. Traffic control: Create structure on an open warehouse floor by lining aisle ways and traffic lanes with yellow floor tape. You can create several lanes for different flows of traffic, and pedestrians can be alerted to areas not to walk through. 2. Hazard identification: Easy highlight or tape off hazards in the facility. Striped hazard floor tape can be placed around dangerous equipment to warn workers of the risk or could be used to mark off arc flash boundaries. 3. Establishing pathways: Similar to traffic control, laying down floor tape for pedestrian will keep the facility much safer. Emergency evacuation paths can be created with glow-in-the-dark tape and floor stickers. Using floor tape, you could create paths and arrows to direct workers to necessary emergency stations like the eyewash station, first aid station, or where the AED is located. 4. Organization: Create storage areas with floor tape shapes, like corners, and ensure every piece of equipment has a home. Using rolls of tape, you can create specific storage and staging areas. 5. 5S strategies: If your facility is considering going Lean or implementing 5S strategies, floor tape can be one of the handiest and most universal tools to use. Floor tape will help with sorting and setting, the ease of cleaning tape will ensure shine, choosing appropriate colors will standardize, and the durability of industrial floor tape will sustain you floor markings for years to come.